Prompting students to use physical gestures like high fives in the classroom helps build a sense of community. All good teachers strive to build a sense of community in their classrooms, and they know from experience that creating and strengthening bonds between students isn’t a one-time event. In the real world and in school, fellowship and mutual respect among peers are fostered—or frayed—over days and months, not during the first week. Because class time is precious and passes too quickly, strategies that leverage small moments in instruction have great potential for helping students gel as a community. One quick, low-prep, high-impact approach to cultivating community is something we call Group Salutes. A salute is a gesture of recognition or respect when people meet or say goodbye. 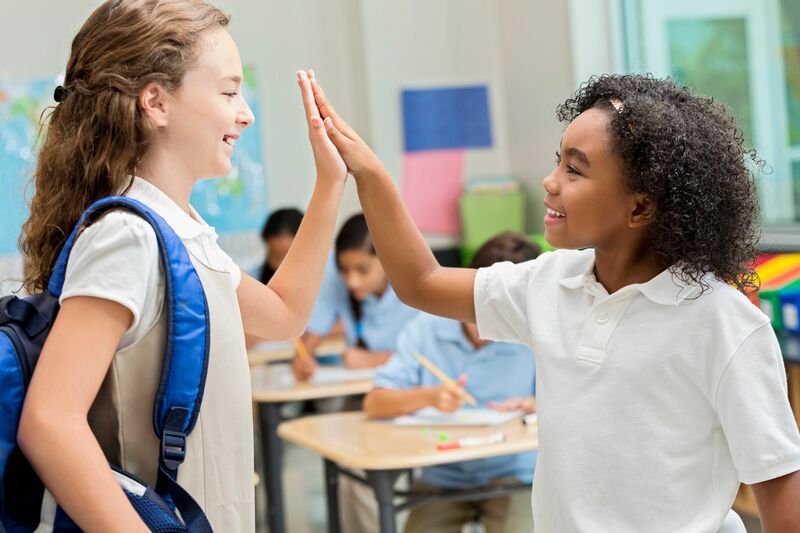 In the classroom, a Group Salute is a teacher-prompted social or physical gesture shared between two or more students at the beginning or end of an interaction. Group Salutes can be used with students of all ages, including ones who are shy or struggle with social skills, and English language learners. At the outset of an interaction, Group Salutes help break the ice and lead students to connect in a non-academic way. At or toward the end of a dialogue or task, they provide a sense of closure or accomplishment. Group Salutes can also involve physical interactions such as handshakes, fist bumps, one- or two-handed high fives or low fives, or hand claps. Variations that don’t involve contact include an actual salute, a wave, or a quick individual dance move (“When you’re done, face each other and dab or floss”). Combining oral and physical responses works too. For instance, ask students to huddle up and put their hands in the middle, like a sports team, and repeat a phrase or chant. Or say, “Raise your pen or pencil in the air” and follow with a teacher- or student-led toast. Teachers should use prompts that make sense with their own and their students’ personalities. Group Salutes are not simply clear signals for starting and stopping activities—they’re a subtle and effective strategy for teaching students how to exercise courtesy, be cordial, and use good manners. In fact, the Latin root of salutation, salutare, means to “pay one’s respects to,” which is essentially what the teacher is asking students to do through words and gestures. Evidence from real-world situations suggests that Group Salutes can contribute to team success. A study produced by the University of California, Berkeley, found that the NBA teams whose players touched the most (via high fives, fist bumps, etc.) in an early-season game had the best records for the season. The researchers attributed this to the increased trust, goodwill, and camaraderie experienced by the players. And Google’s Project Aristotle found that the company’s most successful teams were those with a sense of psychological safety—those whose team members trusted one another enough to take risks without fear of judgment. In the classroom, Group Salutes are a concrete step toward establishing that kind of trust. We’re not suggesting that every interaction between students should involve a Group Salute. Students of all ages appreciate a balance of predictable and novel routines. Responding to the same social or physical cues day in and day out can get stale or feel robotic. For that reason, consider using Group Salutes frequently with tasks that involve short interactions in the beginning of the school year; later on you can reserve them for tasks that involve more sustained or in-depth peer interaction or collaboration. Or do the opposite: Use Group Salutes sparingly at the beginning of the year and ramp up to launching or closing most quick connections (turn and talks, or Think-Pair-Shares) with them. We recommend keeping Group Salutes brief, fresh, and age-appropriate. This might involve giving a time limit (“You have 10 seconds each to share whether you’ve seen and liked any Star Wars movies”), asking students to contribute ideas for prompts, or having a volunteer tell the class what to do or say. The long-term goal is for students to use Group Salutes on their own, without prompting. When they transfer the underlying social and affective skills to their everyday interactions, we can be confident that we’re building a community.